This weekend, Istanbul will play host to leading modest fashion designers, influencers, buyers and tastemakers from around the world. Twenty-one labels are set to present their Ramadan collections at the second edition of Istanbul Modest Fashion Week (IMFW), among them Indonesia’s Dian Pelangi – one of the global stars of the rapidly-growing modest fashion sector and whose creations feature in the internationally touring exhibition Contemporary Muslim Fashions, currently showing in Frankfurt. 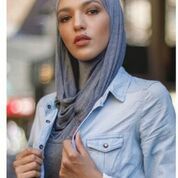 Another of this weekend’s headliners is Feriel Moulai, who turned heads when she became the first hijabi model at Paris Fashion Week last October. The Belgian model of Algerian heritage will join supermodel Halima Aden on the runway in Istanbul, appearing in five shows on Saturday, for Refka, Halima x Modanisa, Mayovera, Sherpa, and Nihan Peker x Modanisa. IMFW organiser and main sponsor, leading modest fashion e-tailer Modanisa.com has published the full programme for the two-day event, which will be staged at the Zorlu Centre, home also to Istanbul Fashion Week. The 21 shows will include a mixture of ready-to-wear and couture comprising day, evening and bridal wear, alongside new collections of beach attire and athleisure. IMFW opens with two exclusive shows at 2pm on Saturday, 20 April. First up will be a “Special Collection” by Modanisa’s popular contemporary in-house label Refka. This will be followed by the eagerly-awaited fashion collaboration between Halima Aden and Modanisa. Also presenting on Day One is Rabia Z. Widely regarded as the “first modest fashion label in the world”, the Afghan-Emirati will unveil her sustainable ‘Basics, Reimagined’ collaboration with Modanisa on Saturday afternoon. Malaysia’s UmmiRiaz International, Barli Asmara (Indonesia), and Turkey’s Mayovera, Meryem Acar, and Minel Ask also present their collections on Saturday afternoon. On Saturday evening, there is an exclusive show by British jewellery brand Sherpa. Day One concludes with top Turkish designer Nihan Peker, who will showcase her first-ever modest fashion collection. A graduate of Istituto Milan and renowned for her minimalist black and white style, Peker’s ready-to-wear capsule collection for Modanisa will feature luxurious pieces for day and evening wear. Day Two features new collections by Dian Pelangi, Amina Fedorenko of Russia, who is also creative director of Muslima Wear, Muni Muni, M Wedding, and two British labels Saiqa Majeed and Till We Cover. Also presenting on Sunday, 21 April, are “Zeruj Designers” – upcoming fashion labels who retail at Zeruj Port – the world’s first shopping mall dedicated to women. IMFW 2019 closes with an exclusive show on Sunday by Mizalle. The Turkish brand launched last year and has quickly established a firm fan base with its stylish and elegant ready-to-wear clothing. Alongside the fashion shows will be three panel discussions: Modest Fashion – Perceptions and Reality through the lens of the media; How has Turkey become the Global Capital of Modest Fashion; and The Business of Modest Fashion – Opportunities and Challenges from Around the World. Keynote speakers include Professor Reina Lewis, who is one of the world’s leading fashion academics, Elle Arabia editor-in-chief Nada Kabbani, fashion magnate Suleyman Orakcioglu, Modanisa CEO Kerim Ture, Burak Kilic, Head of Turkey UPS, branding consultant Yelda Ipekli, entrepreneur and commentator Rabia Zargarpur, author and fashion writer Hafsa Lodni, Hijab in Style editor-in-chief Sahinat Erkilic, Samia Sissani, who organised France’s first modest fashion parade, and UK lawyer turned digital content creator Sebina Hussain. Some seven thousand people are expected to visit IMFW this weekend. Runway shows will be held in the Sky Lounge (upstairs at Zorlu Centre), while the three talk shows and brand booths will be downstairs at Meydan Fuaye. The latter is open to the public. However, those wishing to attend the fashion shows must pre-register. Full details can be found on the IMFW website, modanisafashionweek.com . IMFW is supported by UPS, MAC Cosmetics, and Hair by Mehmet Tatli, and media partners Halal Focus and Modest Russia.